If you notice any problems let us know. to make sure you understand them correctly. Size is 14cm x 9.1cm. THE RUNNING BETWEEN AS-SAFA AND AL-WARWA. SARAJEVO ~ MOSQUE ~ ISLAM ~ MUSLIM. BOSNIA AND HERZEGOVINA. If you notice any problems let us know. If you notice any problems let us know. It was built in the XVII. 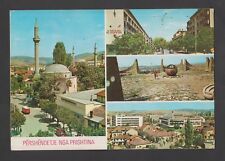 century, when the city of Eger was under Turkish rule. MOSQUE - BOSANSKA KRUPA. ISLAM ~ MUSLIM. BOSNIA AND HERZEGOVINA. If you notice any problems let us know. 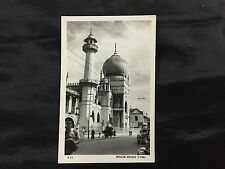 SARAJEVO ~ TWO MOSQUES ~ ISLAM ~ MUSLIM. BOSNIA AND HERZEGOVINA. If you notice any problems let us know. BANJA LUKA ~ MOSQUE - ISLAM ~ MUSLIM. BOSNIA AND HERZEGOVINA. If you notice any problems let us know. SREBRENICA ~ MOSQUE ~ ISLAM ~ MUSLIM. BOSNIA AND HERZEGOVINA. If you notice any problems let us know. TUZLA ~ MOSQUE ~ ISLAM ~ MUSLIM. BOSNIA AND HERZEGOVINA. If you notice any problems let us know. It shows a beautiful internal view of Mosque Hassan II. The Maroc stamp is still attached on its back. The publisher’s code is No. 236. Condition: good. FREE Trial ! SARAJEVO - MOSQUE. BOSNIA AND HERZEGOVINA. This greeting card is blank inside. With our best wishes for a happy and prosperous New Year. See scan for details ! Size is 14cm x 9cm. Condition is very good. Aus Jerusalem PMK. All major credit cards are accepted through secure. SL.ST: Slightly Stained. MNG: Mint No Gum. MH: Mint Hinged. MLH: Mint light marks of Hinged. MNH: Mint Never Hinged. Moroccan Brass Water Jug & Sabor Dagger Greeting Card. This greeting card is blank inside. It was built in the XVII. century, when the city of Eger was under Turkish rule. If you notice any problems let us know.